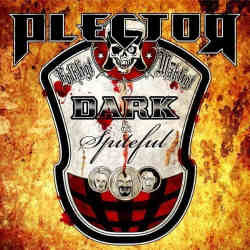 Plector are a Swedish melodic death metal trio with slight thrash influences that was founded at the end of 2006. After a demo and an EP, they now feel ready for their first longplayer Dark And Spiteful. The band photo where the musicians are working hard at making funny faces shows already that the three-piece isn’t taking itself too seriously. Their songs are kept consequently quite simple, making it their prime directive to have fun playing their music. I don’t doubt that they had a good time, but it’s a different question whether their audience will share it. After only a couple of tracks, ideas seem to recur. Nearly all of their songs use the same recipe. The pace is often quite fast, fat beats and nice grooves are used to slow down the tempo. Add to this raw growls that sound rather strenuous after some time. The last two tracks (Kill Yourself Inside and Release Aggression) reconcile thanks to more expressive guitar work, but then again it seems too late to make up for what preceded. Plector still have a long way ahead of themselves. Despite the short length of their debut, the band is unable to keep thing interesting throughout. Right now there are so many talented death metal bands around that it will be hard for Plector to make their stand.